Feta Stuffed lamb BurgersIt’s grilling time here in The Great Northwest. While this normally means making up a batch of burgers or dogs to appease the always-starving hordes of small people running around our house, every once in a while it’s also time to get seriously creative and try something new and completely different. I couldn’t argue that feta stuffed lamb sounded amazing. In fact, since I had a freezer full of ground lamb that had been diverted from another recipe I wasn’t equipped to handle right now, it sounded absolutely perfect. Feta is always on hand and low and behold, I even had some buns tucked in a corner. Armed with the most fantastic method from Savory Sweet Life on how to make the perfect patty. (which is also the ultimate method for making a stuffed patty) and a circle cutter just slightly larger than the buns I was using, I set out. This method of forming patties is remarkably simple and yields absolutely perfect, uniform patties every time. My circle cutter is pretty tall, so we ended up with 4 very substantial patties. If I’d used a lid as suggested in the original article I probably would have ended up with 6 or 8 but big is good when feeding pre-teens and I was happy with the results. I decided that I needed something besides the standard lettuce, onion and tomato topping and opted for thin slices or cucumber and radish. The boys still went for lettuce which is fine by me, but for my tastes these toppings were perfect. Note, there were no condiments used here. These burgers were more than juicy enough to stand without them. If you really must have some kind of sauce, try tzatziki or some yogurt with a squeeze of lemon juice and dill or mint. You definitely don’t want to overpower the burgers themselves. What’s your favorite grilling recipe? Are you a burger and potato salad type or do you go for chicken, pork or ribs? 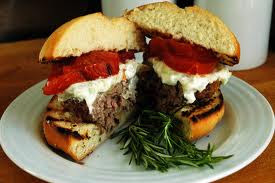 Have you ever made a stuffed burger? We’d love to know! Mix lamb, salt, pepper, paprika and dehydrated onion flakes until well combined. Fill aplastic wrap lined lid 1/2 full of seasoned lamb , leaving a well in the center. Place feta cheese in the well and cover with more of the lamb. Press firmly, removing any jagged edges or leftover meat. Turn onto a foil lined baking sheet. Repeat as many times as necessary. Refrigerate patties for at least one hour before cooking. Get the grill ready, or heat a grill pan or skillet over medium-high heat. Cook patties for 3 minutes per side for rare, 4 minutes per side for medium rare, 5 minutes per side for medium or 6 minutes per side for well done. Turn carefully to avoid tearing the patties open. Allow to rest for 5 minutes before serving. Place on a heated bun, top with cucumber and radish slices and cover with the other half of the bun. Serve immediately.